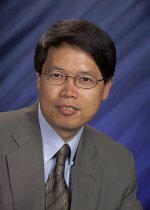 Pacific Northwest National Laboratory researcher Dr. Yuehe Lin has been named Laboratory Fellow, the highest rank that PNNL science and engineering staff can attain. Lin is a longtime contributor to the fields of chemical sensors and biosensors and biomedical nanotechnology. With his colleagues, Lin has established a research program at PNNL in the development of nanomaterial-based chemical sensors and biosensors for environmental, homeland security, and biomedical applications. He and his co-workers have also developed functional nanomaterials for fuel cells, drug delivery, and environmental remediation applications. Lin has distinguished himself through his outstanding program development skills, his mentoring activities, and his publication excellence. He is frequently listed as author of highly cited papers and was recipient of the 2005 Electrochemistry Communications Award for the Best Cited Paper. He has numerous publications, including 20 invited book chapters, 166 journal articles, and 20 conference proceeding papers. His research publications rank high in citations and citations per paper. Lin is the co-editor of the Handbook of Electrochemical Nanotechnology and a section editor of the Encyclopedia of Microfluidics and Nanofluidics. He has 13 patents (10 issued, 3 pending), 5 of which have been licensed to industrial partners for commercialization. For many years, Lin has been an active member of the international scientific community through participation on committees and in the publication arena. He serves as editor and editorial advisory board member of 16 international journals in analytical chemistry, electrochemistry, biomedical engineering, nanoscience, and nanotechnology. He has been frequently invited to serve on review panels for the National Institutes of Health, Department of Energy, National Science Foundation, Department of Defense, and technical organizing committees of international conferences. Also, Lin has been frequently invited to present seminars at conferences and workshops and at major research institutes.